Libby Scott attended the The Alibi Film Sessions, hosted by Alborada, to see what stories about Latin American life these documentaries would reveal. 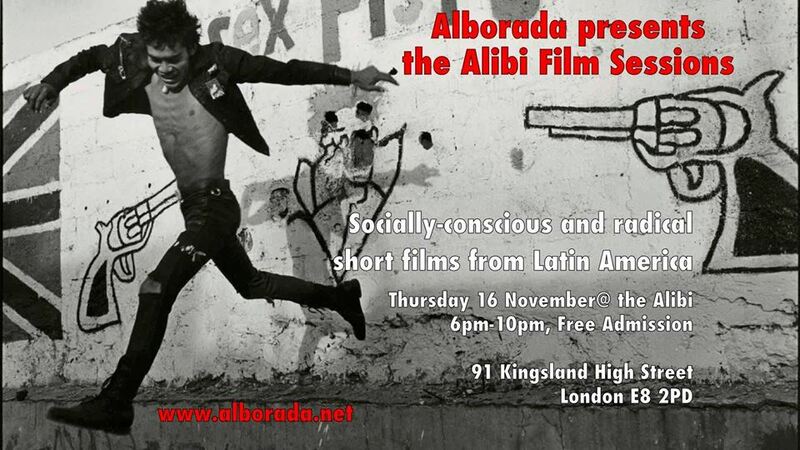 Alborada were back last night at The Alibi in Dalston, for their monthly Latin Shorts residency, with a variety of thought-provoking documentaries. Kicking off the evening, we saw some of the key supporters of the international solidarity movement against the 1973 Chilean military coup regroup to reflect on their actions 40 years on. Thousands of miles away from Pinochet’s brutal regime, in a small Scottish town named East Kilbride, factory workers reacted against orders to run maintenance works on the warplanes that would serve to support Pinochet and the torture, murder and exile of thousands of Chilean citizens. The second film followed the life of Charlie Hill, a US citizen who had taken refuge and been living in Cuba since 1971 to avoid charges of killing a policeman. With the consolidation of US-Cuban relations in recent years Hill’s future on the island is uncertain as the possibility of extradition looms. Along with two other black separatist revolutionaries, Charlie Hill ran into trouble with the New Mexico law enforcement, which resulted in the death of a police officer. They then hijacked a plane and flew to Cuba, where they were granted asylum. Framed around a letter to his 9 year-old son, the documentary takes a look at the events that have brought Charlie Hill to this point, and what lies ahead for him in the new era of US-Cuban relations. The third film was a look into Puerto Rico’s struggling fishing industry. With only 9 nautical miles of surrounding sea to call its own, the islanders are subject to regular checks by US maritime police when fishing out at sea. The film follows Sergio and Raúl, traditional puertoriqueño fishermen, whose hauls are dwindling due to the ecological degradation their homeland is facing. This edition included a screening of the trailer for Alborada’s Pablo Navarrete’s new documentary, Truce, which follows female militants from the FARC (former armed group) during the peace talks in Havana which took place between 2012 and 2016. The peace talks that concluded just before the 2nd October 2016 plebiscite are the first to include a gender sub-commission within their structure, “a historic first” according to United Nations Under-Secretary-General and Executive Director of UN Women, Phumzile Mlambo-Ngcuka. The documentary was recently shown at Bogotá’s film festival and plans are in the pipeline for screenings at regional celebrations of Latin American cinema. The last documentary we saw looked at the lives and identity of Mexico’s “third gender”, known in Spanish as ‘las personas muxes‘. The film is a powerful experience, elegantly combining the hypnotic sensuality of its muses with their honest reflections on self-identification and the reality of living outside traditional gender frameworks in Juchitán, a town in the southern state of Oaxaca. “Even though we take on a feminine role, we have our own muxe identity, which is what defines us,” one says in the film. “People see it normally. No one really cares how you dress. People actually cheer if you look good.” Tracing the roots of their identity back to ancient Zapotec culture, the muxes point out that their “thirdness” does not exist in the heavily gendered European, and particularly Spanish, languages. There is no “él” or “ella” in Zapotec, instead you find words to distinguish human, animal and inanimate objects. The Muxe also thank their pre-Columbian civilisation for the respectful treatment they experience, when compared to the Catholic-influenced homophobic and transphobic treatment of many gender non-conforming communities in more Westernised towns and across the rest of Mexico. To find out more about upcoming Alborada events follow their Facebook page.